Almased is a meal replacement powder for weight loss‚ weight management and overall wellness‚ supported in over 15 years of scientific research. It is made from 3 high-quality ingredients‚ non-GMO soy‚ yogurt and enzyme rich honey‚ combined in a unique fermentation process. Ingredient: Soy protein isolate‚ honey‚ skim milk yogurt powder‚ potassium chloride‚ magnesium carbonate‚ calcium citrate‚ Vitamin C‚ niacin‚ color additive: riboflavin (Vitamin B2)‚ Vitamin E‚ zinc oxide‚ ferrous fumarate‚ manganese sulfate‚ calcium pantothenate‚ Vitamin B2‚ Vitamin B6‚ Vitamin B1‚ Vitamin A‚ folic acid‚ potassium iodide‚ sodium selenate‚ biotin‚ Vitamin D3‚ Vitamin B12. Manufactured for and distributed in the USA. 1- Add 10-12 oz of bottle or filtered water. 2- Add 1-2 spoons of oil (e.g. olive or flaxseed). 3- Add 8 tablespoons (50 Grams) of Almased and blend well. Store in a dry‚ cool place. If seal is broken‚ return for exchange or refund. If you are (or might be) allergic to one of the ingredients or would like to take Almased on a long-term basis‚ please consult your physician or healthcare practitioner. Notice: This package is sold by weight not volume. Contents may settle during shipping. My husband and I tried Almased Synergy Diet a few years ago for weight loss and were both successful. He lost >20lbs and I lost about 30+ lbs after struggling for years to lose baby weight from 3 pregnancies for years with little to no success. Neither of us are diabetic but have reaped major benefits. We both have more energy, have seen cholesterol levels improve and have noticed and over all general health improvement. Almased has been a God send for us, it's helped us develop and keep a health active lifestyle and we continue to use it on and off for weight management. Love mixing dark cocoa powder and cinnamon with it as well as a drop or two of vanilla extract. I also mix in organic grown and ground flax seed for the benefit of the omegas and the fiber content. Please follow the instructions closely for the best results and pay attention to the water consumption requirements or you'll be painfully constipated. Best stuff on earth as far as we're concerned! Nothing, stay true to formula and instructions. 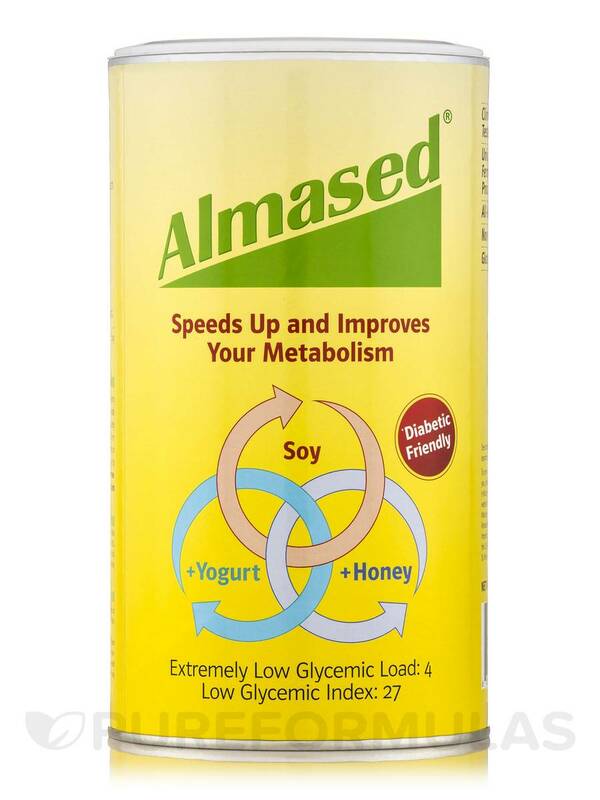 I'm going to buy Almased Synergy Diet by Almased again. This makes weight loss easier and preparation of a meal faster. I added a few berries and coca powder. I shared some with my mom and she did not even know she was supporting healthy weight loss. I tried a little cinnamon and you can add a touch flavor as the directions says and make it your own and you are going to a healthy success knowing you did something good for your body and health. The price as 8 tablespoons is the recommended amount per shake and it goes fast. The price as 8 tablespoons is the recommended amount per shake and it goes fast. This is better than the standard price but it is still pricey to me. I love Almased Synergy Diet, lost 4 lbs in 4 days! My blood sugar is down almost 100 points!! Tastes very good, I have a shake in the morning, a big lunch, and another shake in the evening. I love Almased Synergy Diet! This is the fourth one I have ordered. I love Almased Synergy Diet, so easy to use and the taste is good. In the morning I mix it with vanilla silk milk and in the afternoon I mix it with chocolate silk milk. I have a regular meal for dinner. I have lost weight with it and want to lose about ten more pounds. Ease of preparation and I don't have to think about what I am going to have for breakfast or lunch. This shake is pretty good. Its made from fermented soy and ha added honey and vitamins and minerals. High in protein and fiber. Tastes food and is affordable. What is the different between Almased synergy and regular Almased? If it is any. Wanda, at this time we only carry the Almased Synergy Diet, so if there are other formulas, unfortunately we don't have them to compare to and let you know what the difference would be. We suggest contacting Almased for this information.